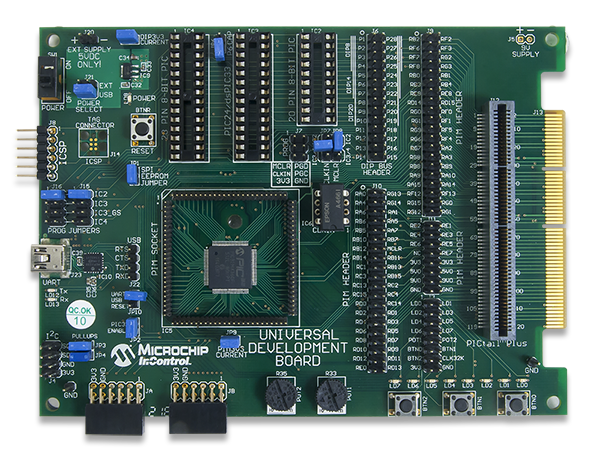 The Universal Development Board (UDB) is a microcontroller development board intended to use with a wide variety of PIC microcontrollers from Microchip®. 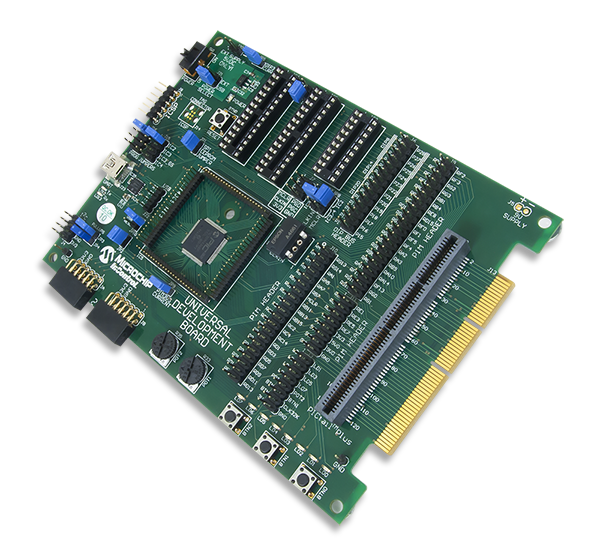 It was designed to support most 3.3V, PIC microcontrollers in 8-bit, 16-bit, or 32-bit varieties. It will accommodate a wide range of Microchip PIM processor modules as well as DIP packaged parts with pin counts from 8-pin to 28-pin. Three DIP sockets are provided: 20/14/8 PIN 8-bit PIC, 28 PIN 8-bit PIC, and 28-pin PIC24/dsPIC33/PIC32MX. 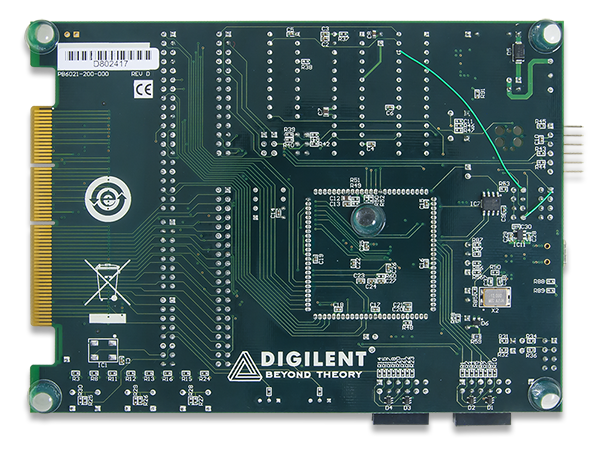 This board also has discrete I/O elements and 2 Pmod ports for further device evaluation or product development capability. Expansion connectors are provided that are compatible with the Microchip PICtail™ Plus line of expansion modules. In addition to the PIM connector and DIP sockets, a PIC32MX360 microcontroller is also provided for use without the need for additional PIM or DIP socketed processors. The Universal Development Board is designed to be compatible with the Microchip Explorer 16 development board. The layout of the PIM connector and PICtail™ Plus bus connections are physically and electrically compatible with the Explorer 16, and many Microchip demonstration programs for the Explorer 16 will work with the UDB. 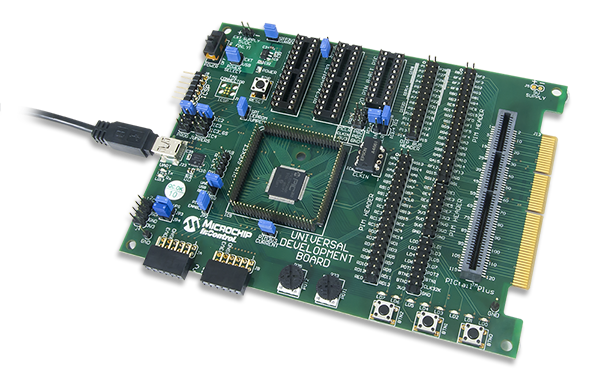 The Universal Development Board is designed to be compatible with the Microchip Explorer 16 development board. The layout of the PIM connector and PICtail™ Plus bus connections are physically and electrically compatible with the Explorer 16, and many Microchip demonstration programs for the Explorer 16 will work with the UDB.